You are currently browsing the daily archive for 4 April 2005. …the last time for awhile, I promise. Below are some photos from our journey, again taken with my mobile phone, so don’t make fun, OK? I really am a pretty decent snapshot photographer. 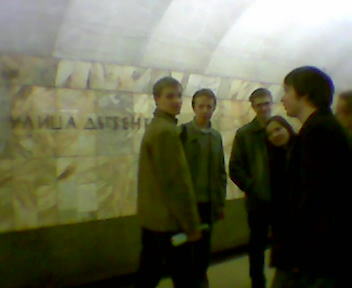 At each metro stop we drank a toast to something related to the name of the station. I don’t remember all of the toasts, so those of you who actually care can check back later, I’ll edit after getting verification. In total, about 35.5 minutes, incuding stops, which average about 30 seconds. This ends this edition of Public Transport Geekdom. This cruddy-quality picture documents the start of our journey at Ulitsa Dybenko, on the southeast side of St. Petersburg. We didn’t leave the station, so I still don’t know what this “neighborhood” has to offer, but I’ll take a wild guess and say there are a lot of high-rise apartment buildings, some shaverma kiosks, a couple of places to play slot machines, and a 24-hour grocery. I think the free bus to IKEA leaves from here. Seven intrepid metro riders made the trip, fortified with wine disguised in juice containers. Cheap red wine in a grapefruit juice box is vaguely reminiscent of sangria. This is an equally cruddy-quality photo of the end of the journey. I didn’t take any photos en route because I was using my phone to time the distances between stops. The platform. Look at that shiny floor! The Exit. This photo’s almost artsy, no? Emerging from the metro into the warmest day of the year thus far made us even more cheerful. From here we headed to an Irish pub which was packed with football, er, soccer fans. Zenit, the St. Petersburg team, won, 5-1. There I ate too many grenki (dangerously tasty strips of greasy toast) and could taste nothing but garlic for the next 15 hours.